4-Word Review: A modern day cowboy. 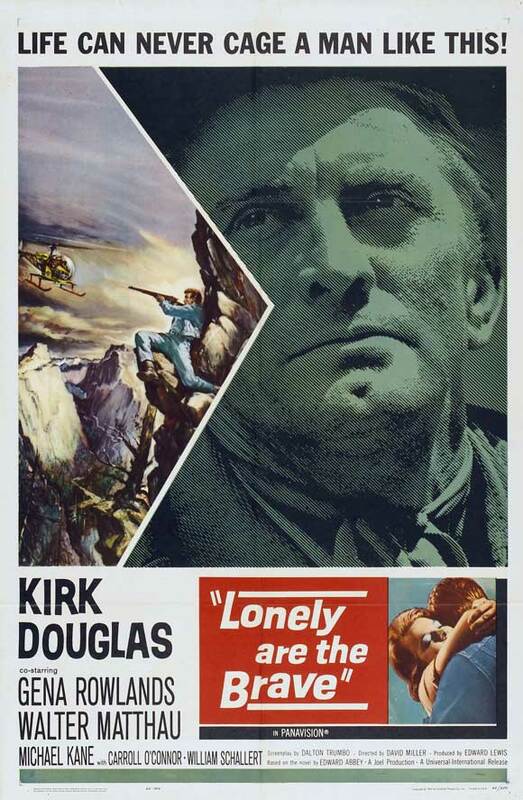 Jack Burns (Kirk Douglas) is a loner cowboy still trying to live the lifestyle of the old west in the modern day world and who must elude the police and all of their modern technologies when he escapes from jail. Kirk is excellent. He really connects with the character and allows the viewer to do the same. The cinematography is first rate with spectacular shots of the western landscape. The cowboy’s escape through the rugged terrain as well as the police pursuit is exciting most to the way and there is a terrific well-choreographed barroom brawl between Douglas and actor Bill Raisch who later went on to star as the one-armed man in ‘The Fugitive’ TV-series. This is also a great chance to see some young actors just starting out including Carroll O’Connor and Bill Bixby. On the negative end I wasn’t too crazy about Walter Matthau and William Schallert as the two policemen who are played too much for laughs. Some of their goofy exchanges are amusing, but it hurts the tension. I also disliked the ending. It does indeed leave an impression and was obviously done to make a statement, but it is not completely effective and is a real downer. It also leaves too many issues open including whether the Douglas character was able to survive. The high production values help immensely and the story structure keeps things interesting and offbeat as well as exciting. The film though cannot overcome its ending, which isn’t very original and no more profound than hundreds of other stories and movies dealing with the same subject. 4-Word Review: Go for the gold. 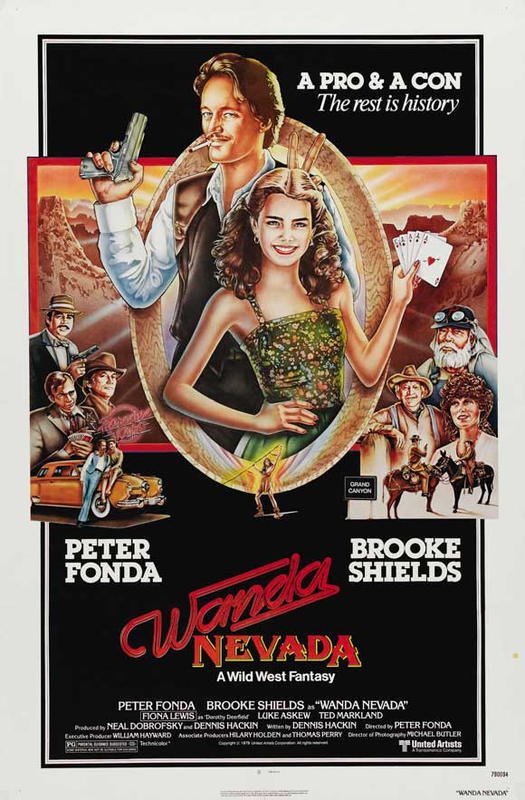 Wanda Nevada (Brooke Shields) is a 13-year-old runaway from an orphanage. Beaudray Demerille (Peter Fonda) is a drifter/con-man who ‘wins’ her during a poker game. The two don’t get along at first, but then they come into contact with an old prospector (Paul Fix) who tells them of gold that can be found in the Grand Canyon. They follow his map, but find weird unexplained events begin to occur the closer they get to the treasure. 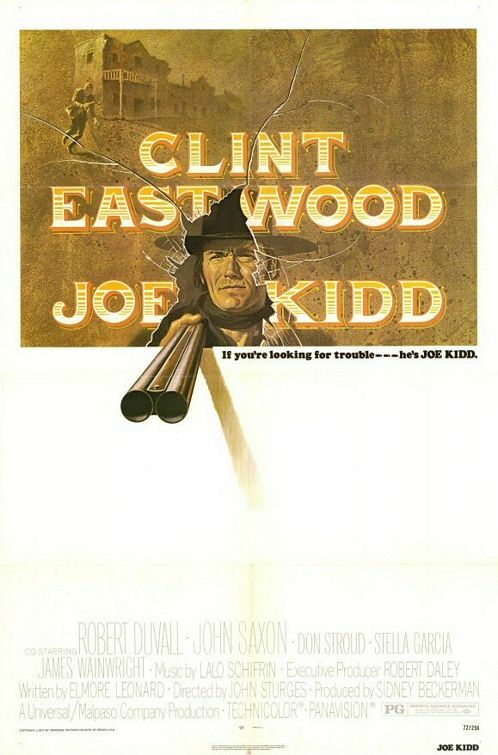 Uneven mix of gritty western/comedy doesn’t ever gel. This is a far cry from The Hired Hand, which Fonda directed 6 years earlier. Although that was not a perfect film it still had a great cinematic style and moody flair that this one completely lacks. The story is slight and predictable and goes on much too long with a laid back pace that while not completely boring is never very interesting either. The biggest hurdle though is the fact that we have a 13-year-old girl and a man in his 30’s not only expressing their love for each other, but forming a relationship, which many viewers will probably find quite creepy. Shields is great and helps give energy and flair to an otherwise lackluster production. She displays a nice sassy attitude and her facial expressions are amusing. She looks ready to blossom into late adolescence and many times seems to show more acting ability and charisma than her older counterpart. The supporting cast is good although they appear much too briefly. Unique character actor Severn Darden is on hand who tries to steal Wanda away from Beaudray, but just when his character starts to get interesting they have him killed off. Peter’s dad Henry appears in a cameo looking almost unrecognizable in a long beard and bug-eyed goggles. Brooke’s real-life mother Terri has an amusing scene as a hotel clerk. Fix is also good in what turned out to be his last film. On the flip side Luke Askew and Ted Markland are boring as the bad guys who chase after Wanda and Beaudray through the canyon. Their comical banter is unfunny and their bumbling ways allows for no tension. The scenery is gorgeous and if you’ve never made it out west you’ll feel like you have after you’ve seen this. The best views are the bird’s-eye shots of the two rafting down a river. The color is bright and vivid and an overall excellent transfer from MGM’s Limited Edition library. In some ways this film reminded me of Mackenna’s Gold as both films had a similar plot and both also added in a mystical element at the end. However, like in the other one the special-effects look cheap and hokey. The light pleasing quality is hampered by an otherwise bland execution. Why it was chosen for the setting to be the 1950’s instead of the present day I am not sure as it doesn’t add anything to the plot. 4-Word Review: Chuck’s on a train. 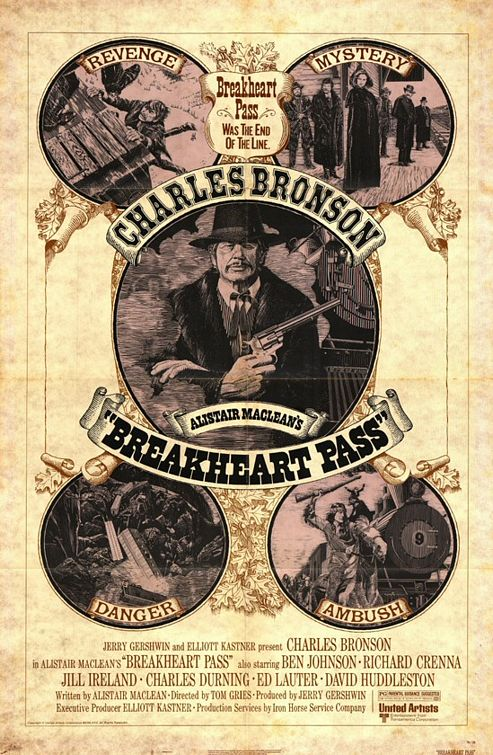 John Deacon (Charles Bronson) is a prisoner on a train headed Fort Humboldt. The train is carrying medical supplies to help the people there who are suffering from a plague outbreak. Amongst the passengers on the train is a Governor (Richard Crenna) a U.S. Marshal (Ben Johnson), a priest (Bill McKinney) and a load of Calvary soldiers, but as the ride progresses strange things begin to happen. People disappear and then turn up dead. Everyone seems to have a secret to hide and what is inside the boxes labeled medical supplies isn’t medicine. 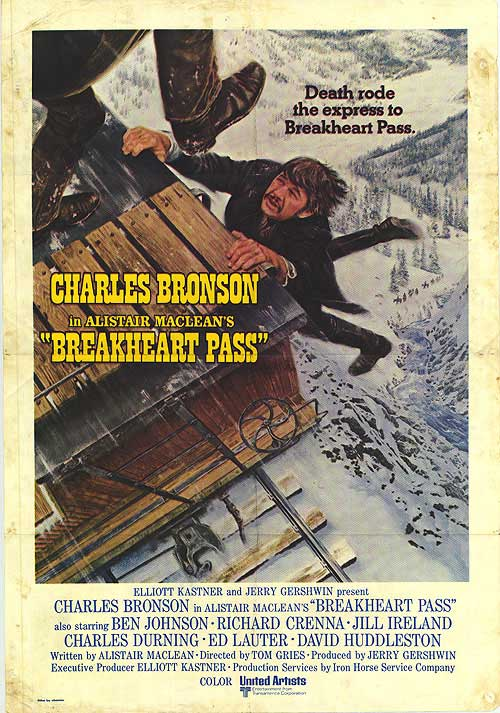 This is the first Bronson/Ireland production to be given a big budget and the wintry Rocky Mountain landscape is sumptuous. The plot itself is intriguing and full of interesting twists that grabs you right from the start and keeps you enthralled until the end. Based on the Alister Maclean novel who also wrote the script it is no surprise that it seems more like a spy/espionage thriller than a conventional western yet there is enough gritty elements to keep it passable at both ends. The mixture of the two genres is unique and exciting and for a bubblegum actioner this one hits the mark. The stuntwork is impressive and one of the film’s highpoints. Some of the best moments are when a man is thrown from a train and you see him fall from a bridge all the way to the river below. What makes this stand out is that the conventional, lightweight mannequin was thankfuly not used. Instead it looks like a real human body that even thumps along the wooden posts of the bridge as it goes down making it vivid. Watching the trainload of soldiers spiral off the tracks and go crashing along the mountainside has the same realistic quality. The fight on top of one of the snowy train cars between Bronson and former boxer Archie Moore is well choreographed and the scene of a telegraph operator getting a bullet shot through his head is surprisingly graphic. The supporting cast is good and for a while they outshine Bronson who seems in a way outclassed by their colorful personalities and different acting styles. However, as it evolves Bronson comes into his own and it becomes a lot of fun watching the way he singlehandedly outsmarts and outmuscles all of them. Ireland is beautiful as always and manages to hold her own to the otherwise all male cast. The music becomes an excellent added element. The booming orchestral sound of the opening theme is reminiscent of ones used in classic westerns. The unique score played whenever the Indians appear on screen has an interesting beat and sound. 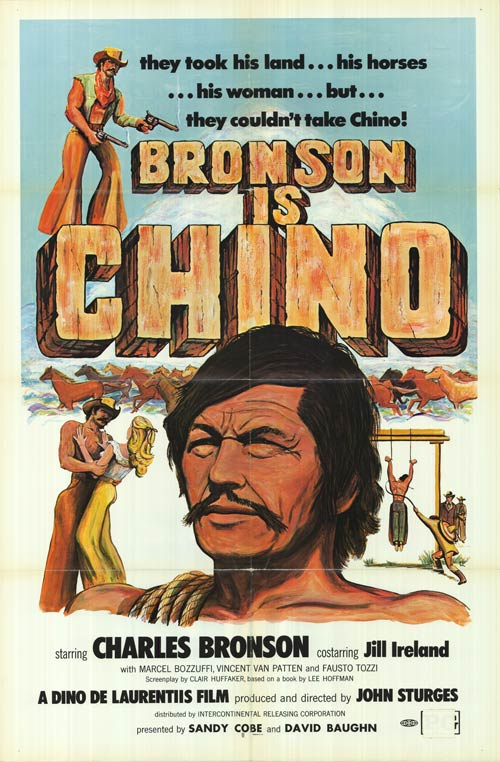 This is an entertainment winner for not only Bronson fans, but for action lovers as well.